Myxofibrosarcoma is one of the rare soft tissue sarcomas. We present a case of a 65-year-old male having large soft tissue mass over right upper arm associated with surface ulceration. On histopathological study tumor was diagnosed as myxofibrosarcoma - high grade according to modified FNCLCC grading system. Like many other tumors of connective tissue, soft tissue sarcoma exhibits high recurrence. In our case, tumor showed features of high grade with local recurrence, large size; however, no evidence of metastasis was noted. For this unpredictable clinical behavior, we are presenting this case. Myxofibrosarcoma is a connective tissue neoplasm of fibroblastic origin set in a myxoid matrix and has been classified by some as a myxoid variant of malignant fibrohistiocytoma. , The term myxofibrosarcoma was previously reserved for a low grade malignant myxoid tumor that presents mainly benign microscopic appearance. Angervall et al. and Merck et al. 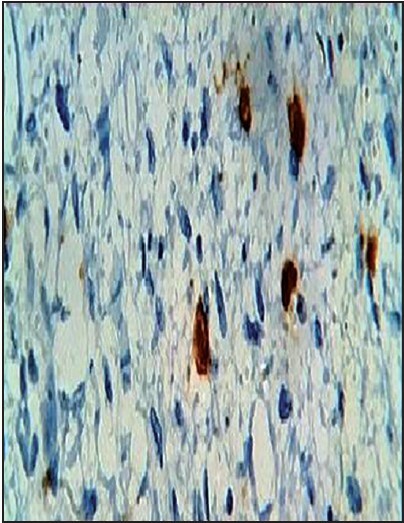 divided the lesion into four grades according to cellularity, atypical features, mitotic activity, and myxoid content. Weiss and Enzinger  applied the term myxofibrosarcoma grade 1 to those tumors having highly myxoid fibroblastic sarcoma (>50% myxoid component) with spindle cells having minimal atypia. World Health Organization (WHO) specified myxofibrosarcoma as a spectrum of malignant fibroblastic lesions with variably myxoid stroma, pleomorphism along with distinctively curvilinear vascular pattern. We report this case to present the clinical, histopathological, and immunohistochemical features on a large right upper arm mass. We present a 65-year-old Indian male referred to our hospital with a recurrent large mass measuring 20 cm × 20 cm × 10 cm over the right upper arm. The lesion was painful, and patient reported a rapid increase in size during the last 1-year. Patient had a history of swelling at same site 5 years back which was gradually increased in size over a period of 1-year up to 2.5 cm. It was operated by local practitioner but recurred after 10 months which gradually increased to present size. History of a sudden increase in size in last 1-year and presented with surface ulceration and tenderness. No previous medical records were accessible. Secondary changes of ulceration, fungation, sloughing, cellulitis, and edema of arm were noted. Computed tomography scan-arm showed diffuse soft tissue mass; however, margins were not well-demarcated due to extensive edema. Clinically, it was suspected as malignant soft tissue tumor- ?liposarcoma, ?fibrosarcoma, ?rhabdomyosarcoma. Tumor was surgically excised and sent for histopathological examination. Systemic examination revealed no significant findings. Routine investigations revealed anemia, leukocytosis with neutrophilia. 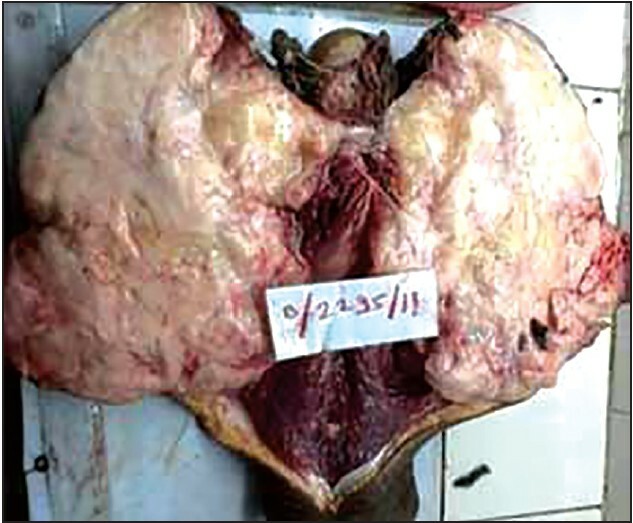 Clinical and radiological investigations revealed no evidence of metastasis. No significant contributory family or past history was noted. There was no history of irradiation for the prior lesion. Received specimen of large, diffuse, irregular, grey white, multinodular mass from right upper arm measuring 20 cm × 20 cm × 10 cm. The overlying skin showed irregular, fungating ulceration with exudation and nodular masses coming through it. Cut section showed grey white, soft to firm, multinodular, gelatinous mass with glistening surface [Figure 1]. Mass was free from muscle and bone. Microscopically showed ulcerated skin and deeper soft tissue tumor having hypocellular myxoid stroma with cellular areas [Figure 2], forming nodules consist of spindle cells having atypical, hyperchromatic, pleomorphic nuclei [Figure 3]. Scattered multinucleated tumor giant cells were noted. Increased mitotic activity (4-5/10 high power field) was noted along with necrosis. According to modified French Fédération Nationale des Centres de Lutte Contre le Cancer (FNCLCC) grading system, our tumor scored 5 (mitotic count score 1 + myxofibrosarcoma score 2 + necrosis score 2), that is, grade 2 - high grade. Tumor showed a distinctively curvilinear vascular pattern. The stroma showed sparse lymphocytic infiltration. On histopathology, diagnosis was given as high grade myxofibrosarcoma. The immunohistochemical study was advised. 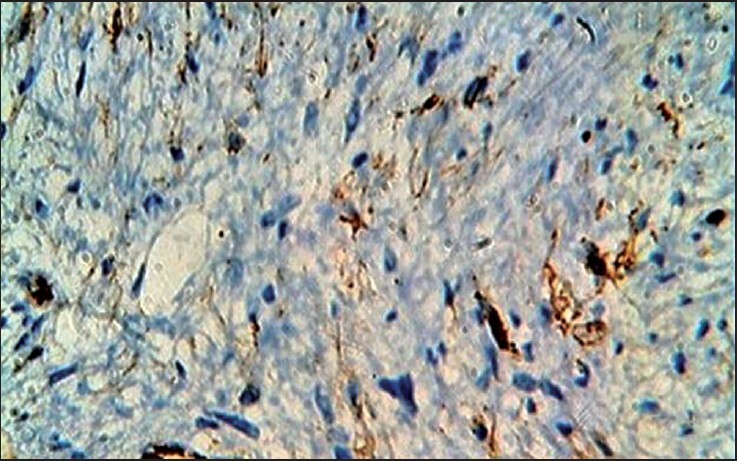 Immunostain showed strong, diffuse vimentin positivity, smooth muscle actin focally positive [Figure 4] and [Figure 5]. Tumor cells were immunonegative for S-100 protein, pancytokeratin, EMA, myogenin, caldesmon, desmin, CD-117, CD-34, and MDM2. On this final histopathological diagnosis was given as high grade myxofibrosarcoma-right upper arm. The surgical margins, surrounding muscles, neurovascular component, skin, bone were free from tumor. On the basis of clinical, radiological, and histological findings; our case was in Stage II according to AJCC staging system for soft tissue. Currently, the WHO recognizes myxofibrosarcoma as a distinctive entity with specific clinicopathologic characteristics. , The myxoid malignant fibrohistiocytoma without myogenic, lipoblastic, or chondrogenic features should be diagnosed as myxofibrosarcoma. 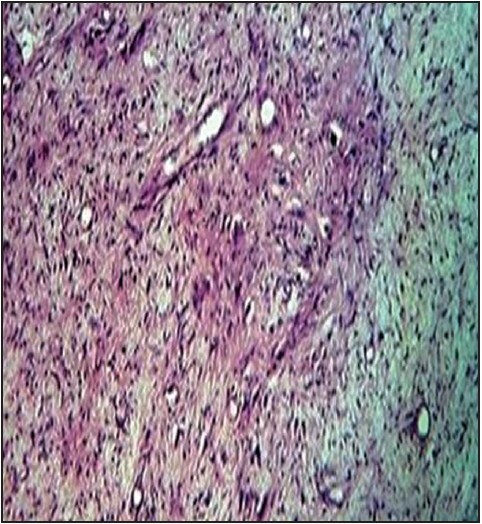 Distinctive histologic features included the following: A commonly nodular growth pattern, a myxoid matrix containing elongated curvilinear capillaries and fusiform round or stellate tumor cells with indistinct cell margins, slightly eosinophilic cytoplasm and hyperchromatic atypical nuclei. These lesions varied from hypocellular mainly myxoid and purely spindle cell appearance (low-grade neoplasm) to high-grade pleomorphic lesions with multinucleate giant cells, high mitotic activity, and focal areas of necrosis. In our case tumor showed recurrence, large size (20 cm), and variation in cellularity, nuclear pleomorphism, increased mitotic activity. 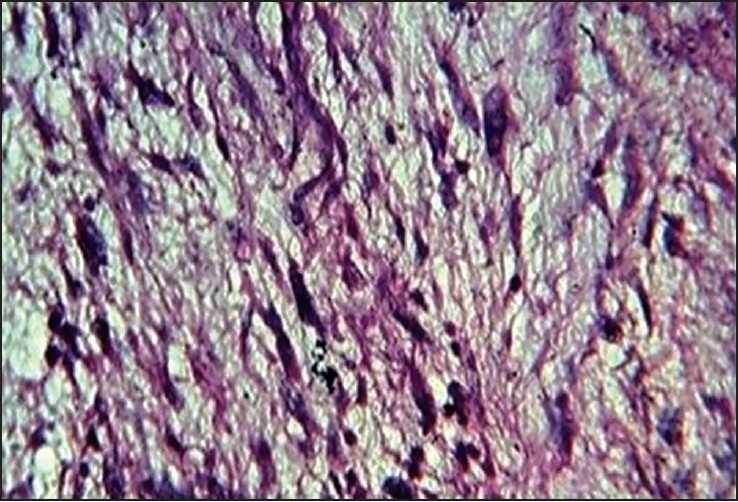 On light microscopic features, the diagnosis was given as malignant soft tissue tumor-myxofibrosarcoma - high grade. The different conditions having myxoid and malignant stromal spindle cell component including myxofibrosarcoma, myxoid liposarcoma, and fibroblastoma were kept as a differential diagnosis. In our case, fat stain was negative the final diagnosis of a myxofibrosarcoma was reached after evaluating all the clinical, radiological, light microscopic, and immunohistochemical features of the mass. Recurrence rate for myxofibrosarcoma is high irrespective of tumor grade, metastasis is quite rare and occurs almost exclusively in higher grade tumors. , In our case, tumor was high grade on histology, but there was no evidence of regional or distant metastasis and was in Stage II. The last clinical follow-up (after 24 months of surgical excision of the tumor), no evidence of metastasis was noted. Many reports claim favored sites of myxofibrosarcoma metastases to the lung, pleura, lymph nodes, and skeleton. Kaya et al. had given report of mxyxofibrosarcoma of forearm metastasis to lung. But in our case, no such metastasis was noted. We are reporting this case with clinical, histopathological, and immunohistochemical features of a high-grade myxofibrosarcoma right upper extremity having recurrence and large size. Although tumor was high grade, there was no evidence of metastasis in our case. Myxofibrosarcoma presents a challenging situation for the management due to their unpredictive clinical course. Mansoor A, White CR Jr. Myxofibrosarcoma presenting in the skin: Clinicopathological features and differential diagnosis with cutaneous myxoid neoplasms. Am J Dermatopathol 2003;25:281-6. Wada T, Hasegawa T, Nagoya S, Kawaguchi S, Kaya M, Ishii S. Myxofibrosarcoma with an infiltrative growth pattern: A case report. Jpn J Clin Oncol 2000;30:458-62. Angervall L, Kindblom LG, Merck C. Myxofibrosarcoma. A study of 30 cases. Acta Pathol Microbiol Scand A 1977;85A:127-40. Merck C, Angervall L, Kindblom LG, Odén A. Myxofibrosarcoma. A malignant soft tissue tumor of fibroblastic-histiocytic origin. A clinicopathologic and prognostic study of 110 cases using multivariate analysis. Acta Pathol Microbiol Immunol Scand Suppl 1983;282:1-40. Weiss SW, Enzinger FM. Myxoid variant of malignant fibrous histiocytoma. Cancer 1977;39:1672-85. Mentzel T, Calonje E, Wadden C, Camplejohn RS, Beham A, Smith MA, et al. Myxofibrosarcoma. Clinicopathologic analysis of 75 cases with emphasis on the low-grade variant. Am J Surg Pathol 1996;20:391-405. Fletcher CD, Unni KK, Merten SF, editors. WHO Classification of Tumors: Pathology and Genetics of Tumors of Soft tissue and Bone. Lyon, France: IARC Press; 2002. Fletcher CD, Gustafson P, Rydholm A, Willén H, Akerman M. Clinicopathologic re-evaluation of 100 malignant fibrous histiocytomas: Prognostic relevance of subclassification. J Clin Oncol 2001;19:3045-50. Kilpatrick SE, Ward WG. Myxofibrosarcoma of soft tissues: Cytomorphologic analysis of a series. Diagn Cytopathol 1999;20:6-9. Kaya M, Wada T, Nagoya S, Sasaki M, Matsumura T, Yamaguchi T, et al. MRI and histological evaluation of the infiltrative growth pattern of myxofibrosarcoma. Skeletal Radiol 2008;37:1085-90.